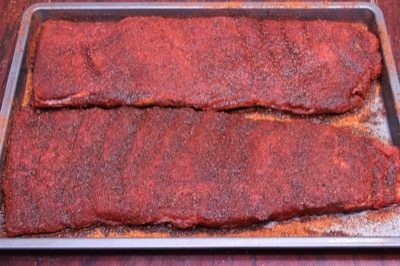 I receive emails every week asking how to make super tender spare ribs in the smoker and some even say that the 3-2-1 method still doesn't get them as tender as they like. 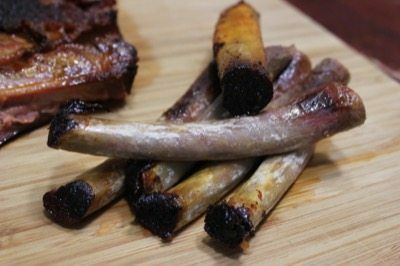 This week I'm going to show you how to make spare ribs that are so fall apart tender that you can just pull the bones out as if they were in hot butter. I made these spare ribs a while back and we deboned them (very easily I might add) and made one of the best rib sandwiches I've ever had (and that's saying something)! 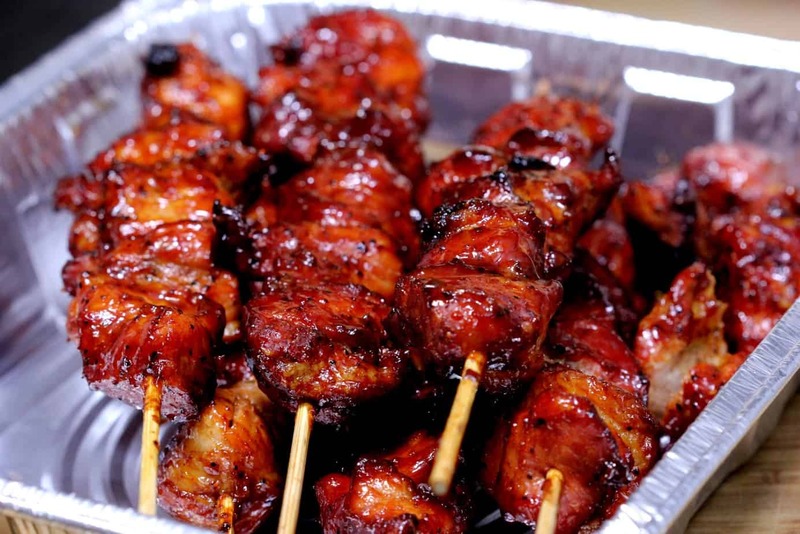 The flavor is also unbelievable since we will apply my original rub recipe (instant download after purchase) on them the night before and give them things of beauty all night to soak up the good stuff. I could not get over the flavor as well as the tenderness on these and everyone at the table agreed that these were to die for. 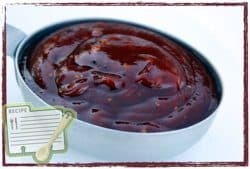 Although my original rub is good on a lot of things, it was made especially for ribs and to use anything else is nothing short of a disaster in my book. Try the best and you'll see what I mean! Remove the spare ribs from the package and rinse under cold water. I purchased my ribs already cut St. Louis style and for this reason, I wanted to make sure that there was no bone fragments. The rinsing takes care of this. The ribs are then patted dry with a clean paper towel and set aside. 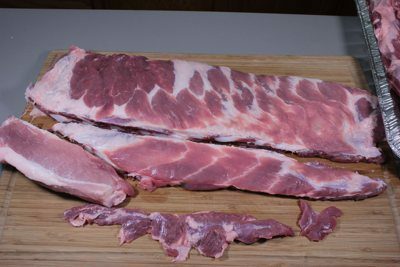 It occurred to me that some of you may not know what St. Louis style ribs are.. it's just a style of trimming the ribs to get rid of the less desirable parts of the spare ribs and make them into a better looking rack much resembling a rack of baby backs. With the ribs laying bone side up, you'll notice a shiny, plastic-like membrane covering the bones. Work your finger, a spoon or some other implement under the membrane, work it loose and grasp it with a paper towel to pull it clean off. This takes practice but in no time you'll have it. Don't fight with it.. if you have trouble with it, just get what you can and leave it at that. It's not the end of the world if it remains. With the ribs still laying bone side up, coat the meaty part of the bone side with lots of the original rub (instant download after purchase). Be extremely generous as this will create the delicious crust that you'll rave about later. Give a light sprinkling over the bone area as well..
Leave them sitting in this configuration for about 10 minutes or until they get that “wet” look. 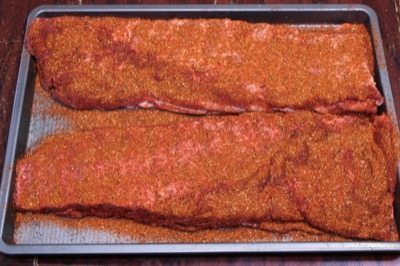 Turn the ribs over to meaty side up and generously sprinkle my original rub (instant download after purchase) all over making sure to hit the sides and ends as well. You can place them in the fridge at this point but after just an hour or so, you'll see how the rub draws the moisture to the top and creates a nice paste. The flavors merge and some of that is drawn back into the ribs. It's a beautiful thing! 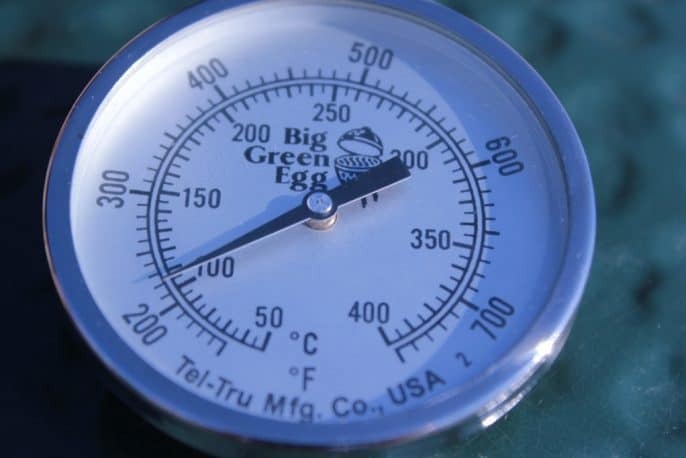 Setup your smoker for cooking at about 230°F using indirect heat. If your smoker has a water pan, fill it up with hot water. You will need enough smoking wood to last about 4 hours– I recommend a mix of pecan and cherry but any smoking wood will work great. 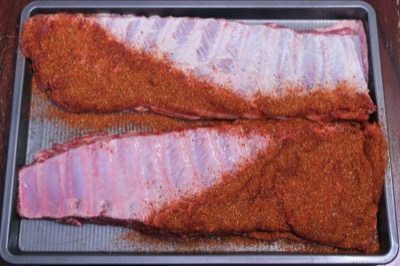 Once the smoker is ready, place the ribs on the smoker grate bone side down with at least an inch between each one to allow the smoke and heat to have access to all sides of the meat. The ribs will stay in this configuration for 4 hours. During this time the rub will turn into a crust (a good thing), the heat will cook the meat and the smoke will flavor the meat. Very carefully remove the ribs from the smoker and wrap the ribs individually with heavy duty foil. I did not get pictures of this process but I wish I had so I could show you how I wrap them. I tear off as many pieces of 18-inch foil about 30-36 inches long as I have racks of ribs. I had 2 racks of ribs so I had 2 pieces of foil this size laid on top of each other. The first rack was taken off and laid in the center of the top piece of foil. Note: often during this wrapping stage we'll add a liquid of some kind but I don't recommend it on these since they will be in the foil for so long. We want them to tenderize but if there's too much moist steam, it can make the rub crust soft and in some cases even dissolve it and we want it to stay intact and crispy. The bottom of the foil was brought up over the ribs then the top was folded down over that. Each side is then carefully folded over. I say carefully because some time a bone will be sticking out and that can easily puncture the foil. The foil doesn't have to be airtight but it's best if it doesn't have holes that allow the steam and juices to escape. The wrapped ribs are placed into a full sized steam pan (about 12 x 20). For what it's worth, I can fit about 4-5 racks of wrapped ribs in one of these. The purpose of the pan is to catch leaks. The foiled ribs will most likely leak.. it's bound to happen and in my opinion, this is an easy way to contain it. Less cleanup is always a good thing! If it's easier, you can also just place the pan of wrapped ribs into your kitchen oven set to 230°F. Keep them at this temperature for 2 hours. At this point the ribs are done and somewhat tender but we want to super tenderize them, remember? This super tenderizing step will go on for about 2 hours. 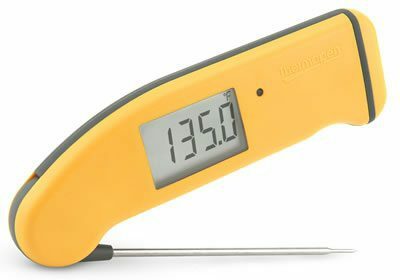 I recommend checking the ribs at the end of this step using the Thermapen Mk4, one of my favorite handheld thermometers which has a very small tip and is able to get between the bones very easily. Open one side of the foil very carefully and check one of the racks to see if it's where it needs to be. 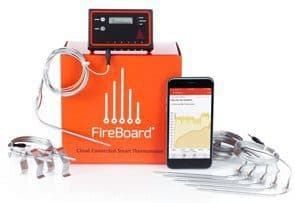 The temperature should be around 195-200°F at this point. Now we just want to let the ribs rest at a really low heat during which time the meat will continue to tenderize, the fat will continue to render and the bones will loosen from the meat. For the final step in the cooking/tenderizing process, turn the smoker or oven down another 30 degrees to 170°F. This step only took about 1.5 hours but be ready to be flexible. At 1.5 hours open one of the packages, grab a bone and try to rotate it. If the ribs are ready you should be able to rotate the bone and even pull it cleanly from the meat with little to no resistance. If you are able to rotate/remove the bones, then good, If there's resistance, wrap it back up and give them 30 more minutes. Unwrap the ribs, flip the rack over to bone side up so you can get to the bones. If they break in half during this step (very likely) it's ok. They will be so tender that they will be falling apart.. that's what we wanted on these. Grasp each bone and rotate to make sure it's loose then simply pull it out of the meat and discard. Once the bones are removed from the entire rack, cut the meat into pieces about 1 inch wide and they are ready to serve. Rinse, pat dry, and remove membrane. Apply my original rub (instant download after purchase) heavier than usual. 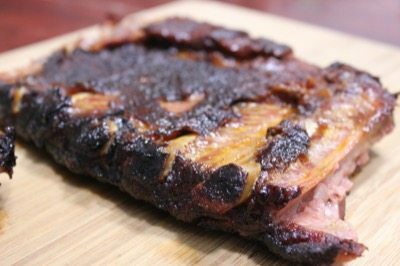 In this recipe, I show you how to make smoked spare ribs that are so fall apart tender that you can just pull the bones out as if they were in hot butter. 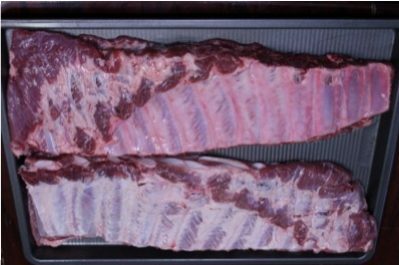 Remove ribs from package and rinse under cold water. 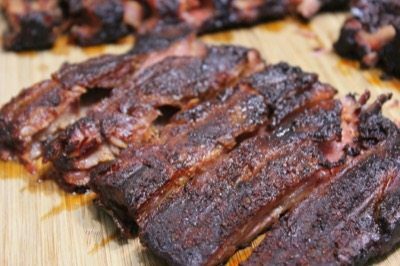 Cut brisket bone and square ends to make them St. Louis style spare ribs. Generously coat bone side of ribs with Jeff's original rub. Wait about 10 minutes for the rub to take on a "wet" look. 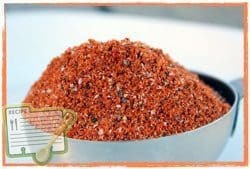 This means the rub has mixed with the rib juices and will stick to the ribs without falling off when you turn them over. 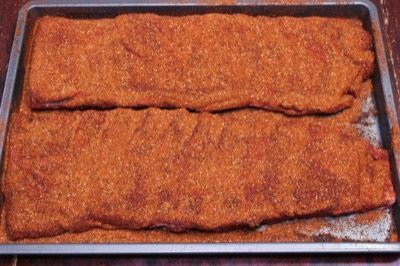 Flip the ribs over to meaty side up and coat the top and sides with generous amounts of Jeff's original rub. 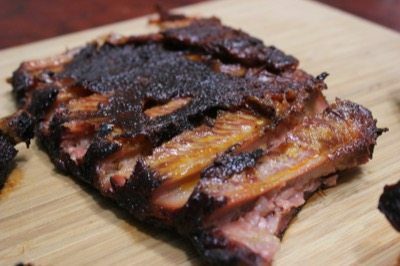 With the ribs on a cookie sheet, place them in the fridge overnight to allow the flavors in the rub to seep into the meat. Set up your smoker for cooking at about 230 °F with indirect heat. If your smoker has a water pan, fill it up with hot water. Remove the ribs from the foil and pull the bones out of the meat. Slice the meat into ribs that are about 1-inch wide. Do you cover the ribs while in the refrigerator? As opposed to figuratively falling apart? Donald, I haven’t tried this method on the rib tips but it should work just fine. Jeff, i tried your recipe for the smoked turkey breast. 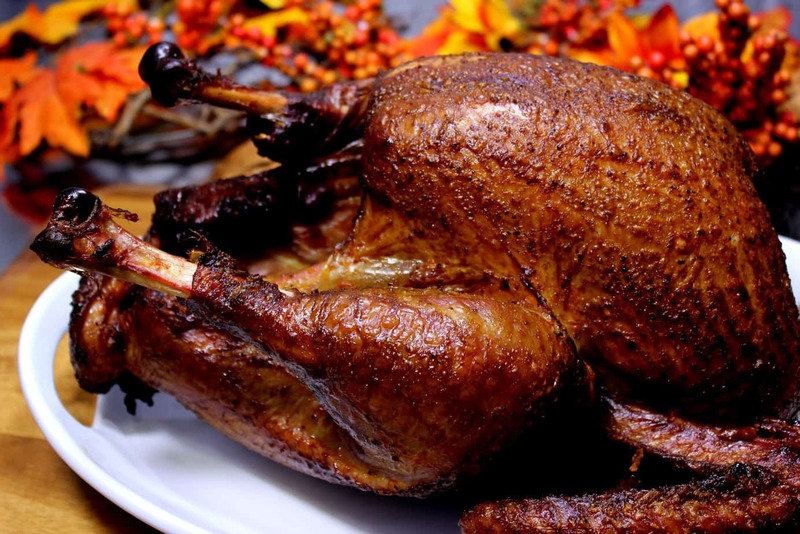 i followed the prep and brine from your book to the letter….except for the actually pan cooking, i also make my own bacon and save the ends and pcs for other things, this time i filled the pan around the turkey with the bacon ends….HUGE HIT! thanks for giving me the tools to make a terrific Thanks Giving meal! i really never thought you could get so much flavor from a turkey! looking forward to doing more recipes from the book! Hello Jeff! This recipe sounds so good. My Wife is getting me a Camp Chef for Christmas, to use when I am not using my Masterbuilt. Can I get the same temps on the Camp Chef? I know you have to dial in the set temps. Hello Jeff. This recipe looks so good. Haven’t tried it yet though. 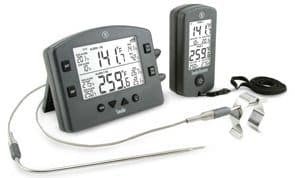 My wife is getting me a Camp Chef for Christmas and can I get these temps on this smoker? I know it has a dial on it to set the temps but I don’t know if you can get those exact temps. I appreciate your help. 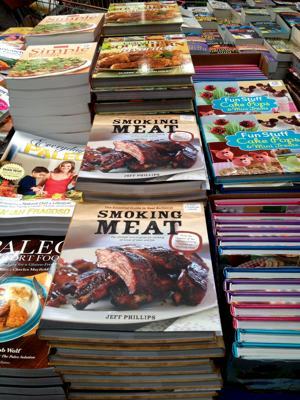 Love your book and recipes. I made these a few days ago and they turned out amazing. My only error was not starting them until the early afternoon. I was up until midnight waiting for them to finish. But the result was well worth it. I’m sure I will use this recipe again but next time I will start them in the morning. Love your recipes! 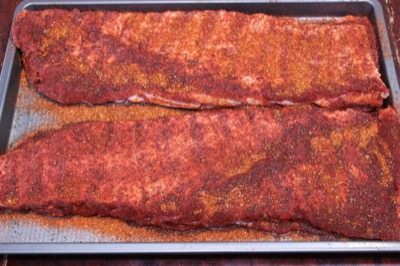 I’m not a competition smoker, just a backyard smoker…but i saw an article on Competition Ribs. 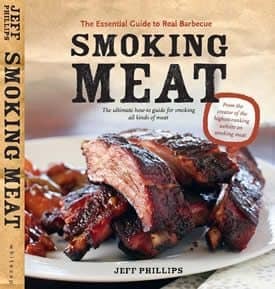 The article said to mop a baste every 1 hour on the first 2 to 4 hours of smoking to keep meat moist during smoking. I assume it’s a light baste to not wash-away the dry rub. 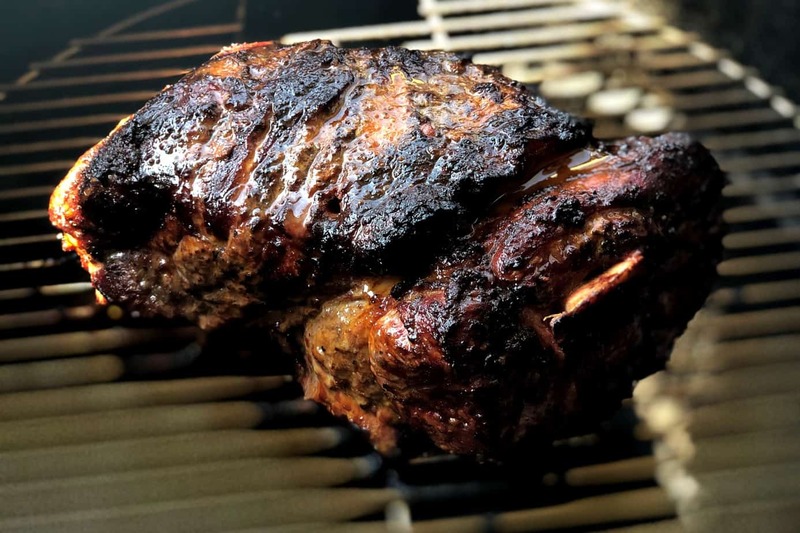 What’s your thought on basting during the initial smoking process? Yes.. until the crust forms, you have to be careful to not wash the rub away by mopping. I prefer lightly spraying apple juice or some other basting liquid onto the meat. I have also been known to use a turkey baster to periodically dispense liquid over the top of a piece of meat. Made ribs this week for a family gathering using your directions for fall apart ribs. Used your tip for mustard coating for the first time. I used Black’s BBQ rub (sorry Jeff; I had it and wanted to use it up) which was very good. Also, followed your timing for the smoking. FANTASTIC!! Ribs fell apart. My brother-in-law ate two full racks. Actually, he was the one who requested ribs. The mustard worked wonders and didn’t flavor the ribs at all. My next ribs will use your rub. Your book is excellent as well. I use a Smokin’ Tex smoker which does a fantastic job of smoking everything. 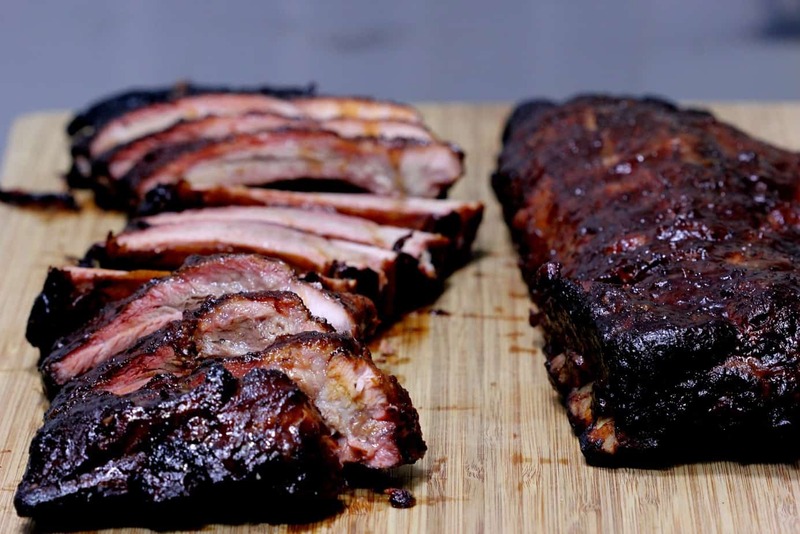 Im just starting to use my electric smoker.But I would like the bones on my rib.I like to hold on to the bone and eat it.Whats my cooking time for the kinds of ribs. The 2-2-1 method is what we normally use on baby backs which leaves them tender but the bone intact. 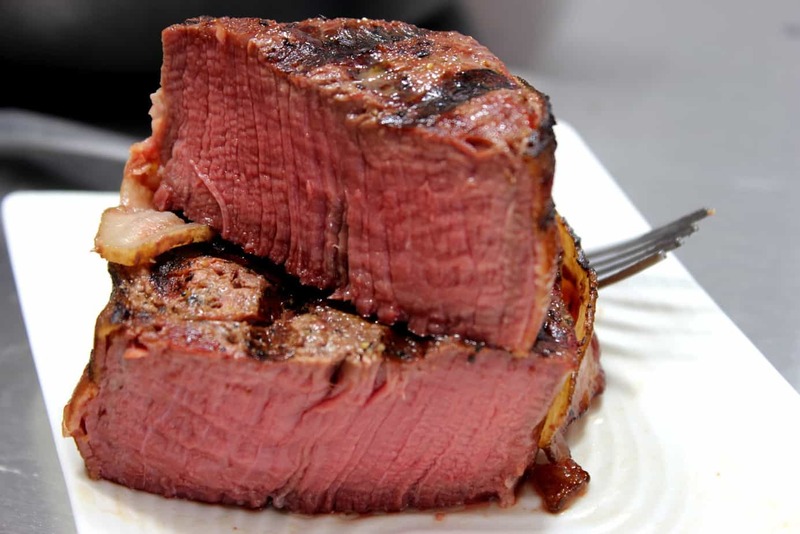 If you want them even less tender than this, you can remove time from stage 2 and add it to stage 1. For instance you might try 2.5-1.5-1 if the 2-2-1 is still too tender. 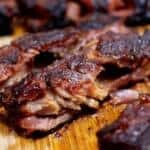 Can this “fall off the bone” method be used with baby backs? Absolutely but you’ll want to reduce the cooking time a little. The baby backs don’t have as much fat and they are usually not as meaty so they will reach this stage faster and you’ll want to be careful that they don’t dry out in the process. Check tenderness..and only perform the next step if necessary. Thanks for the recipe rehash. Always a nice reminder of recipes that can get forgotten. Yes, it has black pepper and some cayenne. I have a Louisianna Smoker that utilizes a fan. Cooking times are quite a bit less with this. 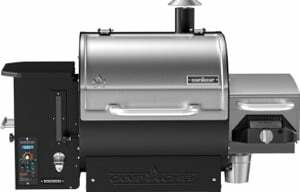 Is there a formula to adjust smoking times to this style smoker? How do you set up the wood? I’ve heard about lava rocks on the bottom but I’ve always just used charcoal. Looks great can’t wait to try recipes! 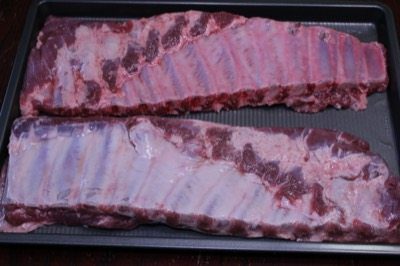 Jeff-These are the ribs I’ve been trying to make!! I have a very basic Brinkmann electric smoker so ribs went on for 4 hrs with cherry smoke and then wrapped in foil for 4 hours. 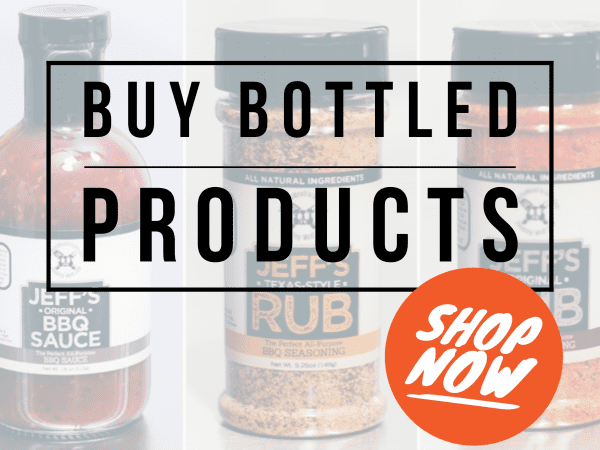 Used your delicious rub as I always do – no sauce needed! Outstandingly tender! I know this is not what’s done in competitions but this is exactly how we like them!! Thank you!! This website is not about teaching folks how to win competitions..it’s about teaching them how to cook the kind of things they love to eat. 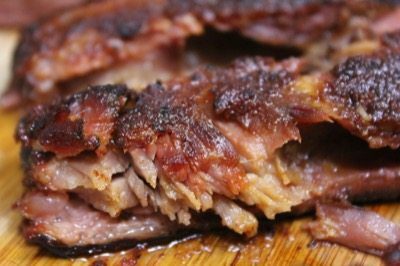 Whether we like to admit it or not, folks love their ribs “overcooked” and who are we to tell them they are not allowed to like them that way? Many of the competitors on the circuit have told me time and time again, what they cook for judges is not what they cook at home for their families and having tasted it a few times, I can certainly understand why. Amen. Thank you. 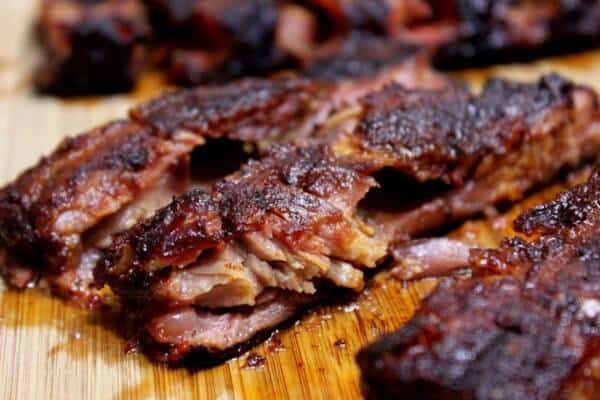 Had this thought of low heat holding for an extended duration creating fall off the bone quality when I went on vacation and noticed the spare ribs would fall off the bone at the local bbq shack at night, but the two following days at the same shack with the same pitmaster and lunchtime being the only changed variable. Thanks for being my validation mechanism. Now off to the store to buy 6 racks of st louis style spare ribs! I’ll say 9 times out of 10 when I have made ribs the person prefers the fall off the bone version. Every time I have made what you would call “competition worthy” ribs people tell me they liked the a previous smoke where they fell off the bone. I was thrilled to get such a great rib recipe. The 3,2,1 method is dead on. I let the ribs go one extra hour after I sauce and put them back on the smoker. Man they are fall off the bone good. And with some coleslaw and a cold beer, well we here in Vermont just love them. I wish I had a good thermometer its on my wish list. Thanks for the great cooking tips. Any thoughts on smoking the ribs for the first 4 hours in the smoker and then finishing them of in the oven or maybe a slow cooker? Maybe even the next day? You can definitely finish them off in the oven but you will not get the same results by finishing them the next day. All of the cooking time must be cumulative in temperature. Jeff, what do you suggest we do for the trimmings on the Saint Louis style ribs? That seems like a waste, which keeps me going with baby backs. Any ideas? I often season the parts I trim off and place them in the smoker with everything else. When they are done I freeze them and add them to beans, soups, stews, etc. for some great smoky, meaty flavor additions. There is something to be said for a little “chew” when it comes to ribs but then there’s the melt in your mouth aspect some people can’t (or at least don’t) appreciate. I’ve achieved this a couple different ways. One on the smoker and the other actually in a slow cooker. Same prep as this recipe shows but 2 racks standing on edge curled up in the slow cooker at low for about 6 or 7 hours. Family said it was one of the best sliders they had. With Jeff’s recipes for rub (minus the heat for my wife) and sauce they were near perfection. If you try this don’t bother with liquid smoke, it almost ruins the flavor, better to leave it out. 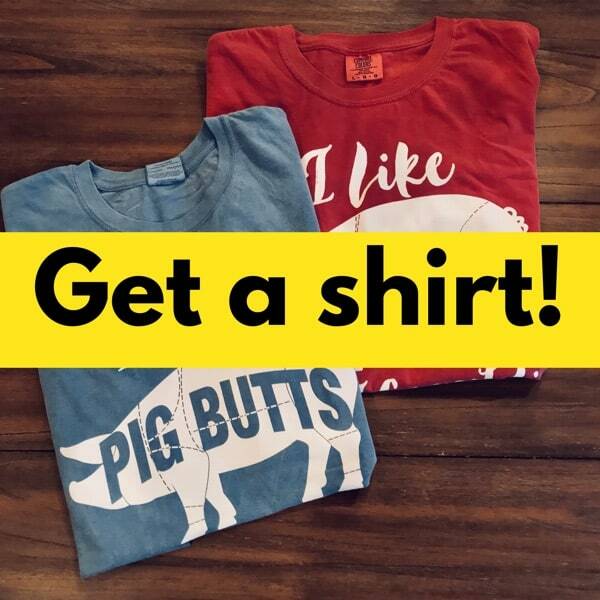 Great for winter time if you can’t fire up the smoker.